Richard D'Ambola & Associates LLC has a client focus in two main demographics. People approaching retirement and high net worth individuals. 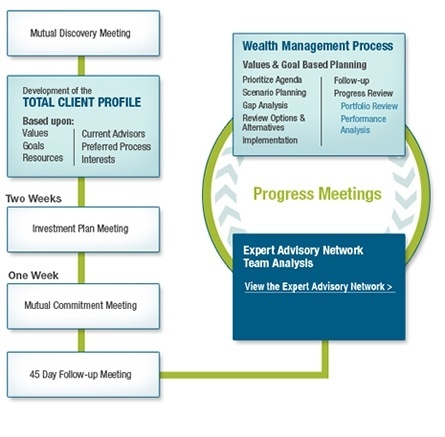 Though not all individuals are high net worth clients or in transition, we have found our services most benefit those individuals who are getting ready to retire, those who have lost a loved one, changing jobs, sending their child to college, or looking to accumulate wealth for other various core financial goals. Many individuals desire a working comprehensive plan, designed to take a snapshot of their current assets and available financial resources. A comprehensive financial analysis helps to develop an implementable plan for the client to follow as they look to achieve their financial life goals. Cash Flow Analysis: budgeting, including a total social security analysis of various filing strategies. Risk Management: review assets available for self insurance strategies versus the possible need for life, disability or long term care insurance. Investments: portfolio designs geared for different client goals. Tax Strategies: relative to investment portfolios and earned income, helping a client keep more of what they earn. Retirement Planning: geared toward efficient income distribution and asset longevity. Review of company pension and rollover benefits. Estate Planning: includes efficient transfer of assets to beneficiaries with an emphasis on the minimization of the wealth transfer tax liability.